In winter the cedar woods provides a calm shelter for the deer. Snow filters through the canopy but the wind is kept at bay. Winter is subdued if only a little among the cedars. In Spring the woods has an opposite effect. Now it feels colder where the sun don’t shine. I felt a chill run down my spine as I entered the dense cedars. Snow still clings on the northern slope where the cedars refuse to let the sun shine through. The deer pass quietly through the shadows leaving a trail that won’t disappear when the snow melts. This is one of the ‘highways’ criss crossing the cedar woods that surround the house. A pocket of ice reveals warmth had penetrated the shadows. The melted snow had formed a puddle now frozen over. As the water soaked into the ground it left the thin ice suspended leaving this unique pattern. The shiny spots on the ice are frozen water drops. In this photo (from the other day) the frozen drops look like bubbles. In today’s photo they look like they’re staring back at me. I stomped on the ice in return. I needed to crack it up in order to prove I was right. I took a photo of one of the many mini frozen waterfalls on the run-off stream before leaving the cedars. It’s not likey to be the last of the season. Deer as usual were browsing in the corn stubble. It wasn’t until I opened up this pic that I realized I photographed the elusive 2 Headed Doe of Morley. Unfortunately the photo is ‘big foot’ quality and only a tabloid is likely to believe me. A flock of Cedar Waxwings perched high in a tree as I passed by. Bad lighting and distance kept me from getting a good portrait of one once again. There were over fifty in the flock and not one would pose for me. My last stop was at the lichen landscape from the other day. I had the feeling I was being watched as I took photographs. I could sense something was eyeing me. Can you ‘see’ the eye? How about now? When the dragon’s nictitating membrane winked at me I did what any self respecting Python Knight of the Round Table would do. I bolted screaming ‘Run Away’, ‘Run Away’. Seeing is believing unless you’re looking in a mirror. The first blooms of this year are a good week late compared to last year. It was a real horse race this year with 3 garden flowers in the running. Crocus, Vinca minor and Winter aconite ran bud to bud. It took a photo finish to declare a winner. Winter Aconite was the favorite, followed by Crocus with Vinca considered the dark horse in the race. The first bud photographed was Crocus. It’s still pretty uptight and not quite ready to open up yet. It did manage to show but it was a couple of lengths behind the others. I knew the race was on when I spotted it. When I see these ready to bloom the Winter Aconite at my friend’s house are likely to have already flowered. I don’t know how this pair of crocus managed to get into the back field but they’ve naturalized. After the 3 or 4 years I’ve seen them there I half expected to see more. They may be surviving but they’re not propagating. I think the quack-grass is giving them a hard time. The favorite is just opening. If the sun was out the Winter Aconite might have been a little faster out of the gate. Two flowers opened just enough to get a peek inside but not enough to win this years race. I can’t say it was a complete surprise. Every year a vinca bloom or two opens around this time. This year it was just a bit earlier while the winter aconite was holding back waiting for the sun. It’s been (I hate to say) cold. Daytime temps have been hovering just below freezing and dipping into the single digits at night. Ice season isn’t over yet. A puddle had an invisible (to the camera) thin layer of ice suspended above the water’s surface. The ‘bubbles’ are actually water droplets clinging to the underside of the ice. I took the next 2 photos yesterday while the sun popped out for a minute. I need to go back and see if I can get a better Lichen Landscape photo but this one will do for now. This landscape will be easy to find again since it’s on a rock pile in the middle of a corn field. Of course I can’t go out back with out seeing a deer in the corn field. What I didn’t catch with the camera were the other 4 deer behind the rise. I might have been able to out wait this deer in order to stalk it if it wasn’t for my wildlife repellant. Pookey never saw them but they sure did notice her. Remember? Dog and I were headed out back. 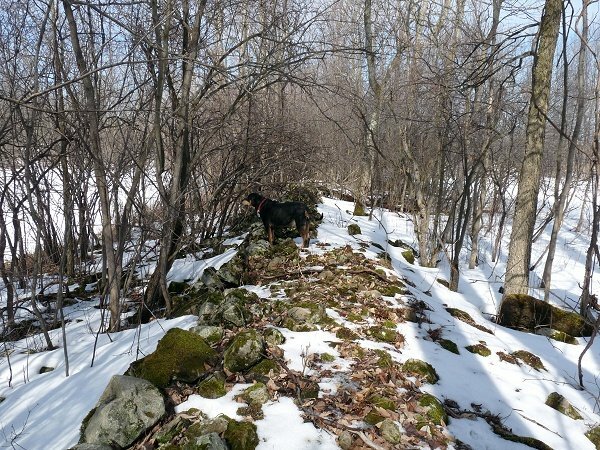 The snow is still too deep for easy walking so we limited ourselves to the stonewalls. Besides the rocks are about the only things showing signs of life right now. 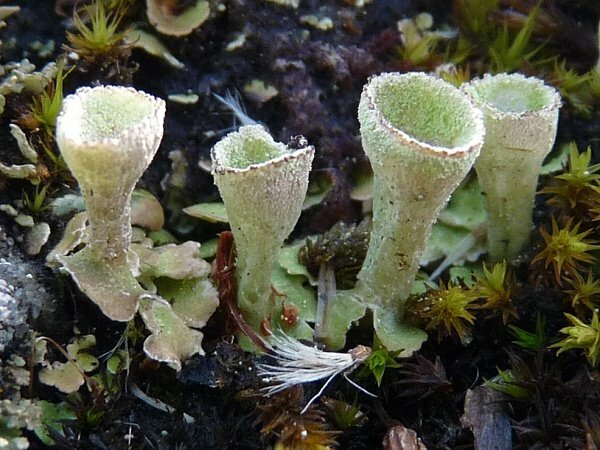 Pixie Cups are lichen podentia. In simple terms, pixie cups are the exposed erect reproductive organs of a low life form. 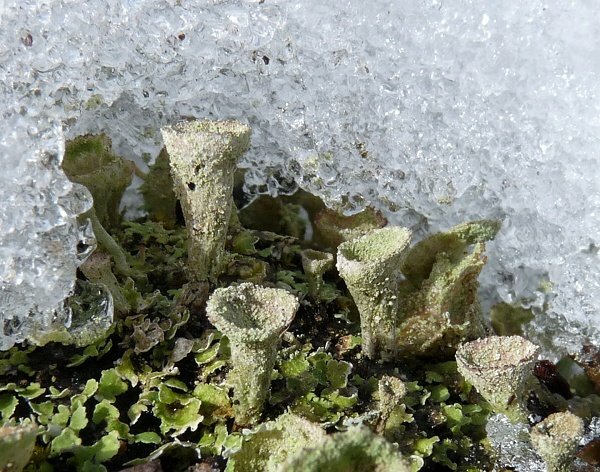 Like moss, lichens can hardly wait for the snow to melt to do the hokey pokey. 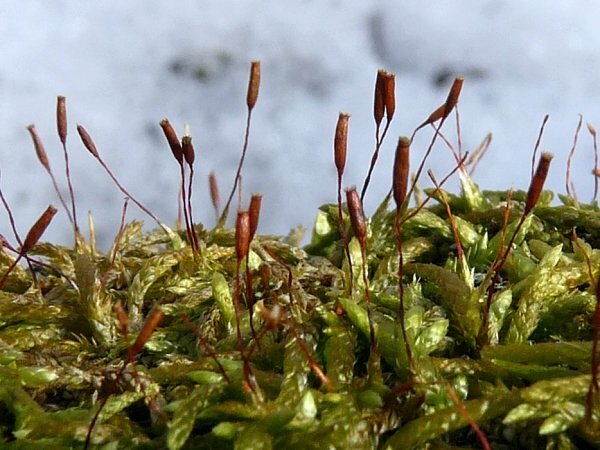 Moss thing-a-ma-jigs are sprouting like mad as the snow recedes. 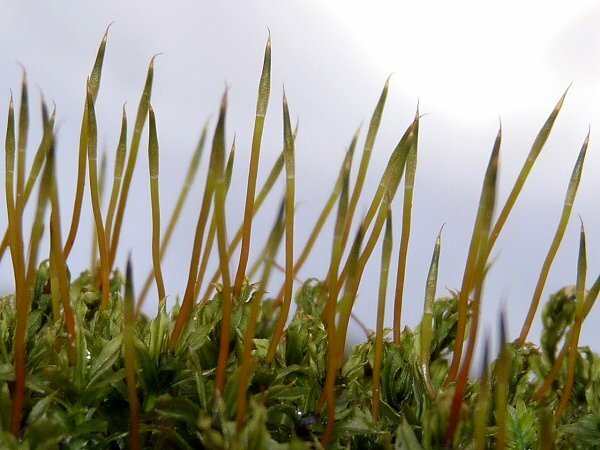 I believe the red-brown spore pods are Fire Moss. 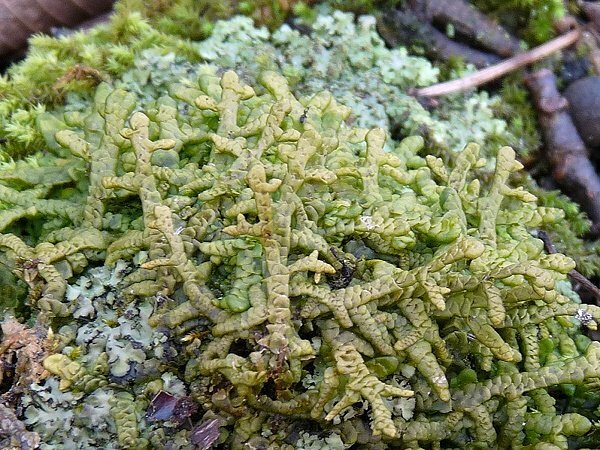 I’m not even going to guess what type of moss the green pods are. They look a bit immature. I came across a moss I don’t remember seeing before. It reminds me of the scaly ‘leaves’ of white cedar. 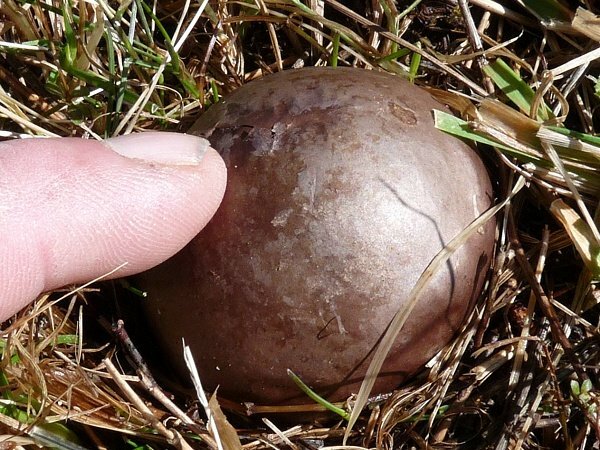 The snow had melted under the red pine trees and I found an old puffball just waiting to be poked. I did get a nice spore cloud but wasn’t able to poke and shoot at the same time. 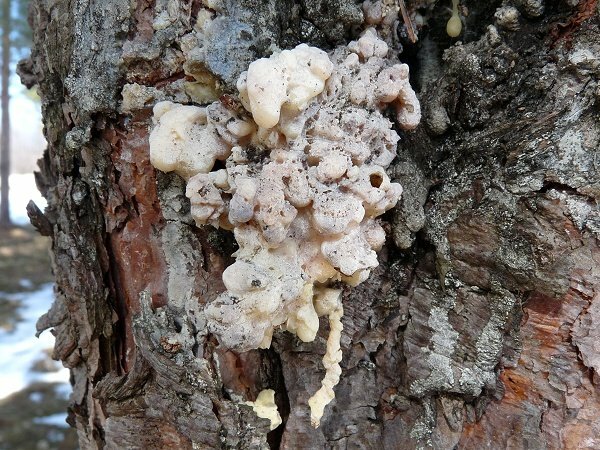 A sap booger waited to be picked on a red pine. Yes, I picked it. It’s going into my fire starting kit. I plan on playing with fire again, soon.